This antibody reacts with mononuclear cells in Hodgkin lymphoma, Reed-Sternberg cells and most anaplastic large cell lymphomas. 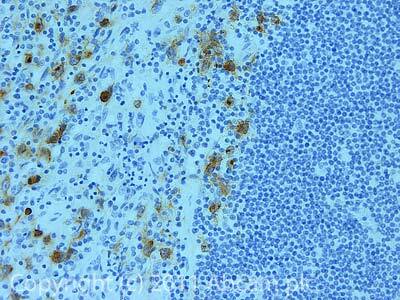 It stains large cells localized around the B cell in the lymphoid tissues. This antibody stains the cell surface and the golgi region in the cells. BALB/C mice were injected with L428 cell line cells. Our Abpromise guarantee covers the use of ab871 in the following tested applications. This antibody has been pretitered and quality controlled to work on formalin-fixed paraffin-embedded as well as acetone fixed cryostat tissue sections. No further titration is required. We suggest an incubation period of 30-60 minutes at room temperature. However, depending upon the fixation conditions and the staining system employed, optimal incubation should be determined by the user. Enzymatic predigestion with proteolytic enzymes may increase staining intensity. Although not required, microwave treatment will considerably enhance the signal. Receptor for TNFSF8/CD30L. May play a role in the regulation of cellular growth and transformation of activated lymphoblasts. Regulates gene expression through activation of NF-kappa-B. Phosphorylated on serine and tyrosine residues. IHC image of ab871 staining in Hodgkin lymphoma formalin fixed paraffin embedded tissue section, performed on a Leica BondTM system using the standard protocol F. The section was pre-treated using heat mediated antigen retrieval with sodium citrate buffer (pH6, epitope retrieval solution 1) for 20 mins. The section was then incubated with ab871, 1µg/ml, for 15 mins at room temperature and detected using an HRP conjugated compact polymer system. DAB was used as the chromogen. The section was then counterstained with haematoxylin and mounted with DPX. ab871 has not yet been referenced specifically in any publications. Publishing research using ab871? Please let us know so that we can cite the reference in this datasheet. There are currently no Customer reviews or Questions for ab871.